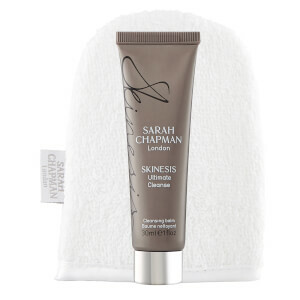 Revitalise your complexion with the Skinesis Instant Miracle Mask from Sarah Chapman, a skin-perfecting face mask developed to transform into a soft, rubbery texture as it sets. Infuses skin with moisturising hyaluronic acid, protein skin tighteners and Moroccan lava clay to lift and firm, restoring a youthful-looking complexion. Suitable for all skin types, the high performance mask is enriched with radiance-reviving vitamin C, brown sea algae and delicate rose to minimise the appearance of pores and imperfections, whilst brightening and refreshing skin. Experience clarified, smoother skin with an even tone. Pour 60ml of cool water into your shaker. 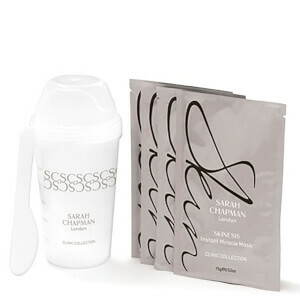 Add the full contents of one sachet and shake until the mask goes silent. Turn upside down and remove the lid. Use your lid as a bowl. Apply quickly all over the face using the spatula, avoiding the hairline. Layer until your mask is thick and even. Allow to set for 15 minutes then peel off removing all traces of the mask. Please Note: Do not put mask down the sink. Avoid contact with clothing and fabrics. Do not eat. Keep out of reach of children. Actives: Argan, Moroccan Lava Clay, Argatensyl, Hyaluronic Acid, Brown Sea Algae, Vitamin C, Rose.